It's an arachnophobe's worst nightmare! Aside from the one with the 6 foot spider. Or the one where your auntie turns into a spider and says "kiss your auntie good night! Aaaahahhahaa!" Or the one where you wake up one morning and you've turned into a spider, and instead of developing a new sympathy for spiders you just scream and scream because there's a giant spider on your bed. 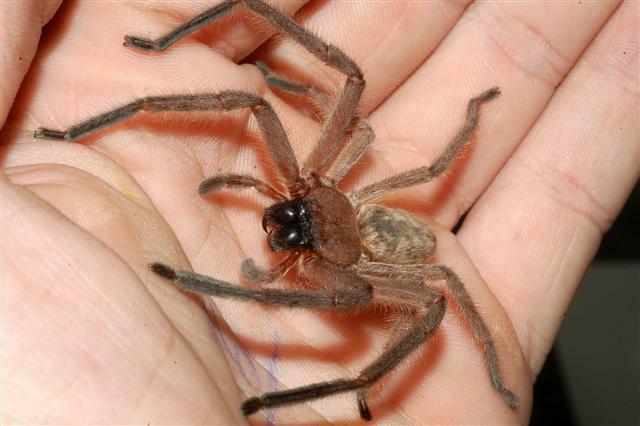 When it comes to big, hairy spiders, the Flat Huntsman is already what one might call a "doozy" or "good example". The largest females can reach almost 5 cm (2 in) body length with a legspan of 20 cm (8 in). Males are slightly smaller. The females have to be big to lay all the eggs and protect her newly hatched young. So far, this is all quite common for spiders. Now those little babies just have to wander away and start their new lives. But what if that doesn't happen? What if the youngsters, or at least a lot of them, never leave their mother? What if they just stay with her and grow up big and strong and hairy? I wonder often the camerman got concerned and worried about David Attenborough? You just got yourself an entire colony of big, hairy spiders! 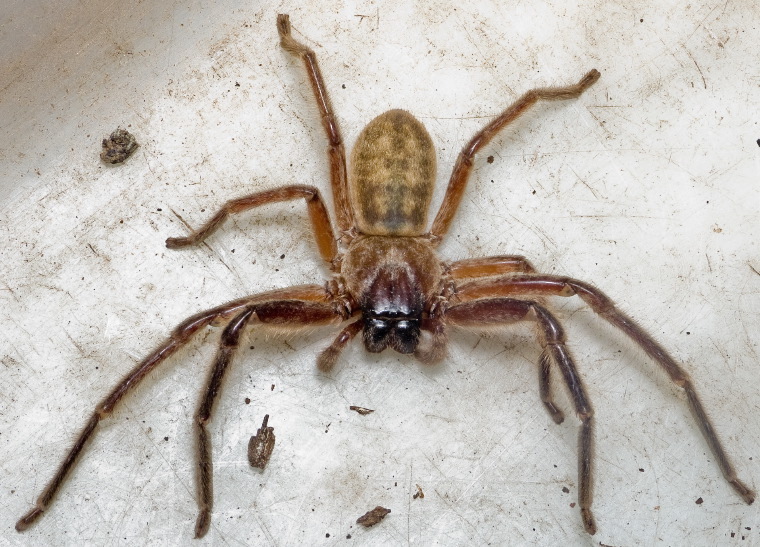 The Flat Huntsman is a social spider found all over Australia, wherever there are appropriate trees for them to hide in. They use their flatness to create a nest under the loose bark of dead trees, using their silk to tie the bark down so it doesn't fall off. We've seen social spiders before, but they're almost all very small web-builders. The Flat Huntsman is unusual in that it's a hunter. All sorts of insects crawl under that piece of bark in search of a dark and safe place to stay. Instead they find themselves in the spider's den. They don't last long and the food is shared among the colony. Each colony can number up to 300 individuals of varying size and age. That's a lot of mouths to feed so they don't rely on insects blundering into their lair. Individuals go out at night and hunt on their own like any other Huntsman. However, if they're eating something and it starts to get light, they stop feeding and carry their prize home to share. Unfortunately there's no co-operative hunting to be seen. They don't gather together a couple hundred spiders to take down a horse or anything like that. There's another arachnophobe's worst nightmare! Flat Huntsman colonies are extremely intolerant of any Flat Huntsman that isn't part of their colony. They'll tear that guy apart like they would a bumbling cricket if he wanders into their home. It's different if the interloper is really tiny. It seems that at least some of those newly hatched spiderlings do indeed escape the nest and find other colonies to live in and add a bit of genetic diversity. They just have to find that new colony before their body measures 6 mm across or they'll get eaten. Interestingly, spiderlings never eat their brothers and sisters. People did experiments on this stuff and found that spiderlings who were all part of a kin group would rather starve to death than cannibalise their family. This is a code of honour that most spiders don't share. At all. 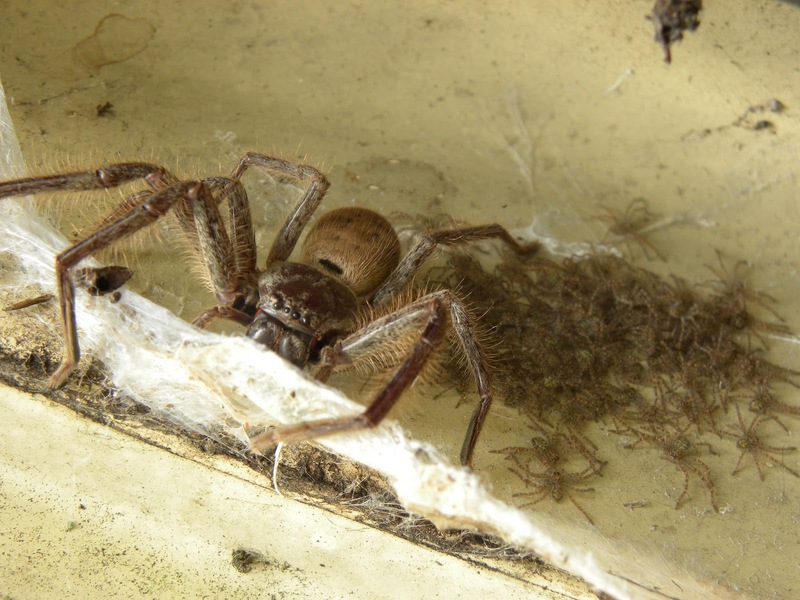 In fact, Flat Huntsman Spiders are sweethearts, really. They're quite timid and don't like to bite people. And if they do, they cause almost no harm at all. That's why they were used so much in the film Arachnophobia; they're practically harmless so everyone was sure they wouldn't do to the actors what everyone pretended they were doing to the characters. At least the New Zealanders appreciate them! The Flat Huntsman was introduced there in 1924, starting out in a suburb of Aukland called Avondale. They've since spread a bit but they're still known as the Avondale Spider. 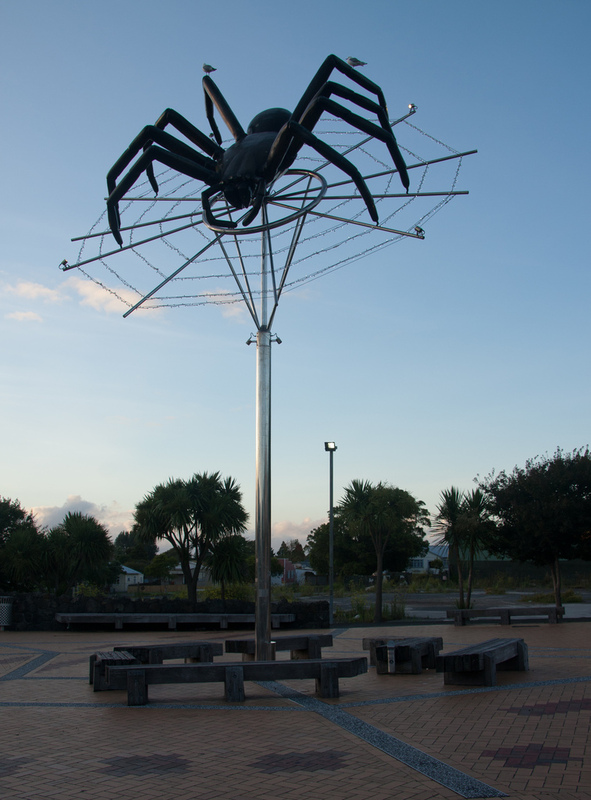 No wonder the New Zealanders put up a statue in their honour. They got half the plot of Arachnophobia right there! All they're missing is the bit where all the people start dying. One must be thankful for big mercies. 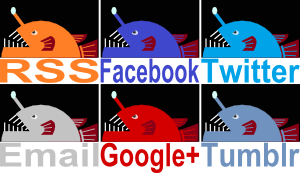 I'm really happy I discovered this blog. It's awesome! 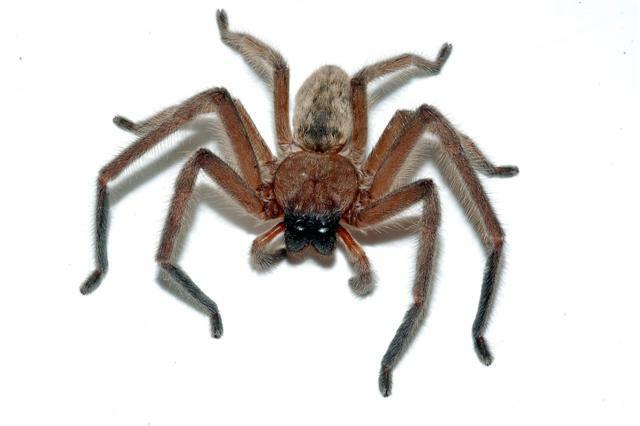 If you ask me, the only good huntsman spider is a flat huntsman spider. SQUISH. @TexWisGirl: They're lovely once you get to know them! @Porakiya Draekojin: They'd be really interesting so long as they don't take over the whole house. @Crunchy: I love finding spiders that make arachnophobia appear as rational as possible.